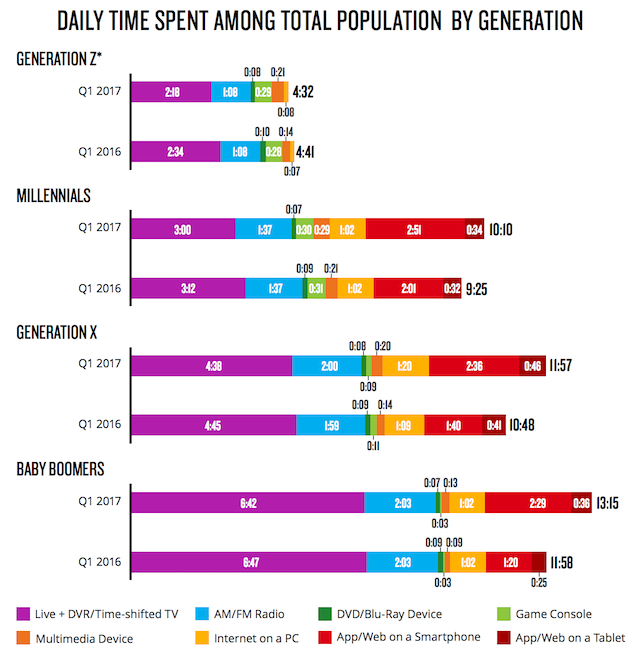 Nielsen has released the Total Audience Report for Q1 2017 with a focus on breaking down the generational differences in media consumption. Weekly reach for AM/FM radio remains high: 94% for Baby Boomers, 95% for Generation X, and 93% for Millennials. Generation Z’s weekly reach is 88%. For the entire adult population, Nielsen reported that daily time spent with AM/FM radio is 1 hour, 51 minutes, level from the first-quarter results from 2016 and 2015. In the latest results, AM/FM radio represented an ever smaller share of daily time spent for each younger age bracket. Baby Boomers had 2 hours, 3 minutes of time with radio in the quarter, and for Generation X it dipped to just 2 hours. Millennials reported just 1 hour, 37 minutes of daily time spent with AM/FM. For Generation Z, the result was just 1 hour, 8 minutes. Monthly time spent data posted the same arc of decreasing AM/FM use as the survey participants got younger. Generation Z had 35 hours, 46 minutes of AM/FM radio time, which rose to 49 hours, 46 minutes for Millennials. Generation X and Baby Boomers were closer together in monthly AM/FM time, at 61 hours, 7 minutes and 62 hours, 18 minutes, respectively. Smartphone usage showed the reverse trend, although mobile data for the Generation Z group is not disclosed due to privacy regulations. Each age group posted spikes in smartphone use between the Q1 of 2016 and 2017. Music lovers aren’t listening to the radios anymore. They’re right : it’s hard to find good music there !